My one year old son just loves when we read books to him. My husband and I saw "Where the Wild Things Are" and I bought it knowing it was one of my favorite books when I was a kid. Half way through the book Max cries out, "Let the wild rumpus start!" Then the next three pages shows them partying. Well, we got up and jumped around and danced, while yelling "RUMPUS, RUMPUS, RUMPUS"! My little boy just laughed uncontrollably, he loved it so much! That's when I thought how great would it be if we could reenact this together, and so it began, the Morgans became the Wild Things. Let me start off with, we bought my sons costume, thinking that realistically that having a Max would be the end of it, that it would be impossible to create the trio. Making the costume took all month! I just started to paper mached a yoga exercise ball during my sons nap time, and then let it dry all day and night. I did 3 to 4 layers per head. We then cut out bowl size eyes and flipped them over for the eye socket. We then used styrofoam for the eye balls. Adding dimension was key for these costumes. We then used rolled up paper to create the nose, cheekbone, horns, ears, and eyebrows. We used poster board for the mouths, and cut an opening to see out of. We taped down all of this and re-paper mached it. We spray glued fur to Carols head, and hot glued red yarn to KWs head.Then my husband painted two works of art! I was shocked, with all of his detail! My husbands outfit, or the Carol character, was half of a very old gorilla costume that his mom use to do sing-a-grams with when she was trying to make extra money. It was very worn and tattered so I had to resew it together. We cut it in half and then spray painted gold stripes onto him. His pants were sweatpants that had black and brown feathers hot glue to it. My costume, or the KW character, was much harder. I don't know how to sew, so I hand stitched the whole thing. I used a couple yards of plush yellow felt, and copied the pattern of an XL sweater and capri sweatpants. It looked a little plain next to Carol's costume so I bought some brown and yellow faux fur for the body and designed it to look like a baby onesie. I also wore yellow tights. I spray painted and hand painted swimming flippers! This was the best Halloween costume ever! 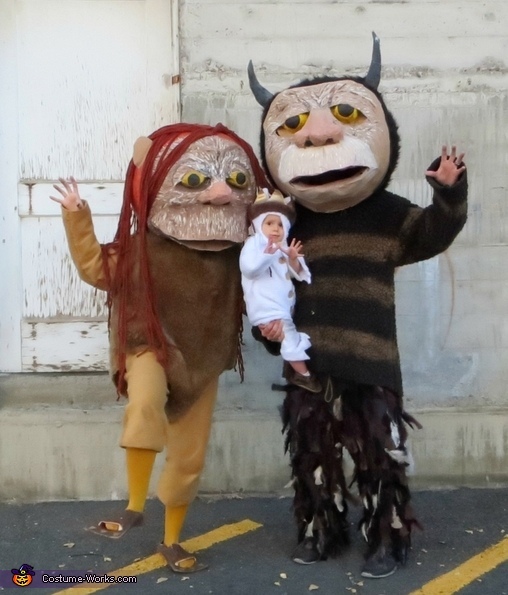 At first, I made these costumes for my son, because he just loved the "Rumpus" book so much. But once we got to the town party this costume was for every child. So many kids and adults just lit up. We got into character for all of them. We would say, "We'll eat you up! ", "Let the wild rumpus start!" We would wave, stomp around, dance, hug, take pictures with kids. It was just so much fun! It was more fun being there for all of them than for us individually. I felt like Santa Clause! It was nice too, since we just moved into the state, and didnt know anyone, we were able to meet new people. We loved it so much,while my husband works, my son and I are visiting the elementary school and reading the kids "where the Wild Things Are"! Volet the wild rumpus of voting start!!! Vote for us!! I am wondering if you possibly are near and if there is any chance to rent these costumes for an event?